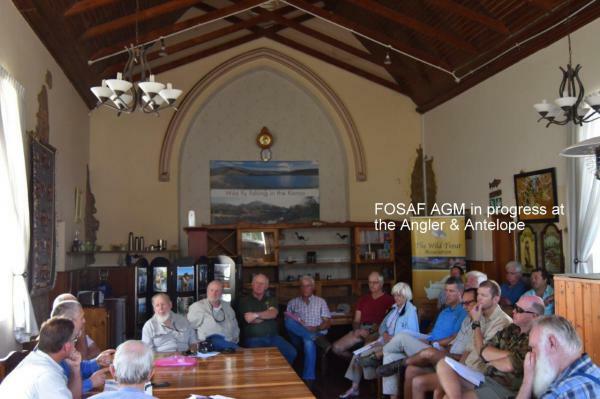 The 2017 FOSAF AGM was held on 29 April in Somerset East, Eastern Cape rather than Johannesburg and this proved a great success. For over 20 years Johannesburg has been the venue for this event, but it was decided in 2016 that the organisation had to give its other important chapters the chance to participate fully in this important meeting and this decision paid off handsomely. Much of the success and the record attendance may be attributed to the fact that the Hobson’s Angler & Antelope guest house was chosen to host the AGM and the Exco meeting which followed. In addition, the local Bankberg Fly Fishing Club made its many dams and streams available to the delegates at no charge and a number took advantage of this over the long weekend and some 156 rainbows were caught and released. Apart from the attraction of Somerset East’s Angler & Antelope and the good fly fishing on offer the main reason for siting the function in the Eastern Cape was to hand over an award to Martin Davies who recently retired from Rhodes University. Martin is well known for being primarily responsible for developing the many trophy fly fishing waters in the Eastern Cape. Apart from providing excellent quality trout fishing in the high-altitude dams this has also provided the stock farmers an additional income and created hospitality jobs in an area plagued by unemployment. The award to Martin Davies was in the form an honorary life membership, the first of its kind made by FOSAF. In view of the good turnout and participation at the meeting especially by the Eastern Cape delegates there was a suggestion made that that next year’s AGM be held somewhere in KZN.